Marcellin College is a leading Catholic secondary school for boys, which has been conducted by the Marist Brothers since 1950. We are guided by the educational and spiritual philosophies of Saint Marcellin Champagnat. Our tradition — embraced by all in our community — promotes unconditional respect, a love of learning, and the personal growth of each individual within a cooperative and supportive faith community. In outlining his pastoral approach to students, Saint Marcellin stated ‘We must love them and love them all equally’. To love young people is to devote yourself completely to teaching them and to take all means that a keen mind can think of to form them in Gospel values. Marcellin College strives to create a rich and diverse learning environment that recognises a focus on developing the ‘whole person’. We provide opportunities for participation, communication and engagement, which can increase self-esteem and build a sense of belonging to the college community. The college provides a comprehensive pastoral program, which supports our boys as they enter and until they exit the college. The college values positive relationships and partnerships between the college, home and broader community. The sense of belonging and support is enhanced by all students becoming members of a House and a smaller Pastoral Group. Marcellin College has an enrolment policy that doesn’t exclude students on the basis of academic ability. We are committed to a comprehensive curriculum that reflects the individual interests and needs of our students. The curriculum is monitored and enhanced to provide the best opportunity for each young man to reach his potential. As students progress through the college, they’re encouraged to take more responsibility for their learning and an active role in considering alternatives for their future. 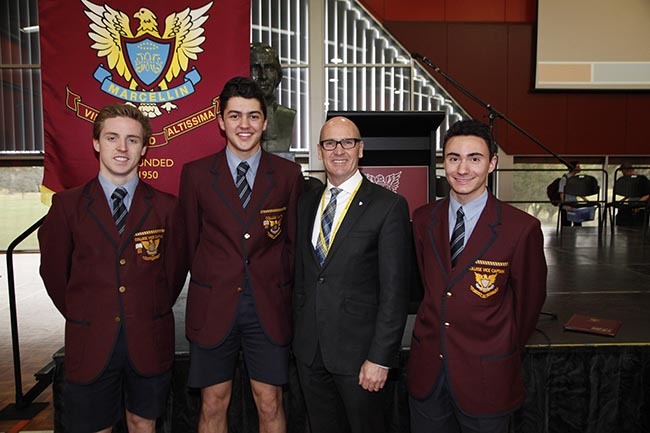 Over the past three years, an average of 98 per cent of our boys have received a first-round tertiary offer. We value the arts, encouraging all students to develop their creative thinking and abilities. The college offers studies in art, drama, media, music, theatre studies and visual communication. Marcellin enjoys a strong reputation in the community and our annual musical productions are always a highlight. As part of our language program, students may study Italian, Indonesian or Chinese, or choose to attend an international educational language tour. Set on 15 hectares of land, Marcellin College is blessed with extensive playing fields, an award-winning gymnasium and everything necessary for students to strive for their personal best. Our Champagnat Chapel, St. Marcellin’s Hall, the Br. Placidus Resource Centre, the Fourviere Schools of Visual Arts, the Le Rosy Technology Centre, a new multi-purpose Hermitage learning space, which includes a Science precinct, community atrium and indigenous garden, Rivat House and the Br. McMahon Performing Arts Centre further enhance our commitment to providing young men with significant facilities that allow them to explore exciting learning opportunities. Our college’s motto — Virtute Ad Altissima — means ‘through virtue and courage to strive for the highest’. Our motto comes alive every day as we challenge our students to constantly aspire for excellence in all that they do. Have your details changed? Let us know. Please fill out the form below to contact the school directly. Do you want to receive a call from the school? I agree to the Terms and Conditions & Privacy Notice. I also agree to receive updates from Good Schools Guide.